Astonishingly carved into hillside rock in the middle of nowhere are the Ajanta and Ellora caves. Both are an important UNESCO World Heritage site. There are 34 caves at Ellora dating from between the 6th and 11th centuries AD, and 29 caves at Ajanta dating back to between the 2nd century BC and 6th century AD. The caves at Ajanta are all Buddhist, while the caves at Ellora are a mixture of Buddhist, Hindu and Jain. Funds for the construction of the caves were provided by various rulers. The incredible Kailasa Temple (also known as the Kailash Temple), which forms Cave 16 at Ellora, is undoubtedly the most famous attraction. The temple is dedicated to Lord Shiva and his sacred abode at Mount Kailash. Its immense size covers twice the area of the Pantheon in Athens, and is one and a half times as high! The life-size elephant sculptures are a highlight. The most incomprehensible thing about the Ajanta and Ellora caves is that they were crafted by hand, with only a hammer and chisel. There are various cave complexes in India, but these are definitely the most spectacular. Northern Maharashtra, around 400 kilometers (250 miles) from Mumbai. The closest railway stations are in Aurangabad for the Ellora caves (45 minutes away) and the industrial city of Jalgaon for the Ajanta caves (1.5 hours away). Travel time from Mumbai to Aurangabad by Indian Railways train is 6-7 hours. Here are the options. There’s also an airport in Aurangabad, so it's possible to fly from many cities in India. Using Aurangabad as a base, it’s most convenient to hire a taxi and drive between the two cave sites. It takes about 2 hours to get from Ellora to Ajanta. Ashoka Tours and Travels, located on Station Road in Aurangabad, is popular and provides car hire to both Ellora and Ajanta. Depending on the type of car, rates start from 1,250 rupees for Ellora and 2,250 rupees for Ajanta. Alternatively, Maharashtra State Road Transport Corporation conducts inexpensive daily guided bus tours to the Ajanta and Ellora caves from Aurangabad. The buses are comfortable air-conditioned Volvo buses. The tours run separately -- one goes to Ajanta and the other to Ellora -- and can be booked in advance at the Central Bus Stand and CIDCO Bus Stand. The Ajanta bus tour departs from the Central Bus Stand at 7.30 a.m. and arrives back at 5.20 p.m. The cost is 595 rupees per person. 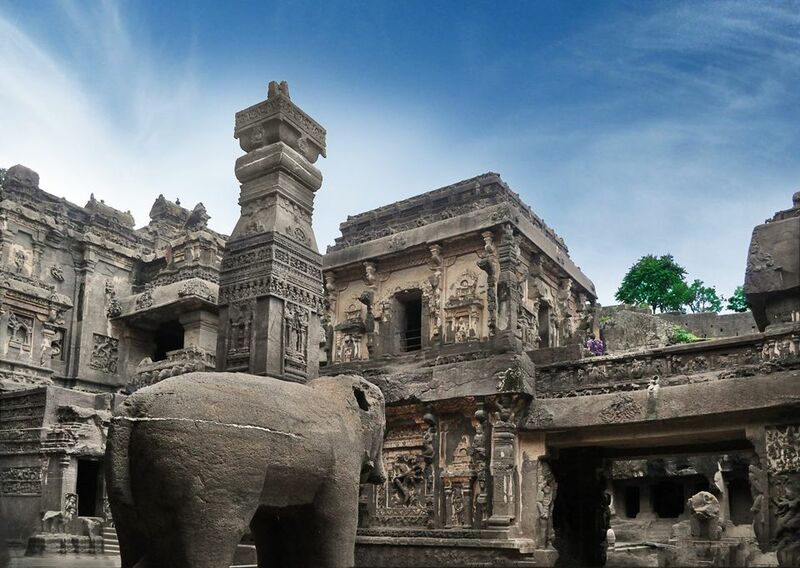 The Ellora bus tour departs from the Central Bus Stand at 8.30 a.m and arrives back at 5.30 p.m. It includes Daultabad Fort, Bibi Ka Maqbara and Panchakki. The cost is 215 rupees per person. Or, if you'd prefer to travel independently, you can easily take a public Maharashtra State Road Transport Corporation bus from the Central Bus Stand in Aurangabad to Ellora (D0825) and Ajanta (D0647). It's worth considering, as you'll be able to get there before the tour buses do. The buses run frequently but they're not air-conditioned. The best time to visit the caves is from November to March, when it's cooler and dry. The Ellora caves are open from sunrise until sunset (around 5.30 p.m.), daily except Tuesdays. The Ajanta caves open from 9 a.m. until 5 p.m., daily except Mondays. Both caves are open on national holidays. However, try to avoid visiting them then (as well as on weekends) as the crowds can be overwhelming and you won't have a peaceful experience. Visiting both the Ajanta and Ellora caves is costly for foreigners. The sites require separate tickets and the price was increased to 600 rupees in August 2018. Indians pay only 40 rupees per ticket at each site. Children younger than 15 years are free at both places. Two new visitor centers opened at Ajanta and Ellora in 2013. The visitor centers provide information about the two heritage sites using audiovisual media. The Ajanta Visitor Center is the larger of the two. It has five museum halls with replicas of the four main caves (1, 2,16 and 17). The Ellora Visitor Center has a replica of the Kailasa Temple. Both visitor centers also have restaurants, amphitheaters and auditoriums, shops, exhibition space, and parking. Unfortunately, the visitor centers are located some distance away from the caves and the replicas have failed to draw the expected number of tourists. In August 2018, Maharashtra Tourism announced that substantial funding had been allocated to enhance them and provide a better experience. Hotel Kailas is located right opposite the Ellora caves. It's a relaxing, tranquil place with stone walls and a scenic landscape, albeit simply furnished accommodations. Rates are 2,300 rupees for a non air-conditioned room, 3,500 rupees for an air-conditioned cottage, and 4,000 rupees for an air-conditioned cottage facing the caves. Tax is additional. The hotel has plenty of amenities for guests including a restaurant, internet access, a library and games. You can also go paragliding. Quality accommodations at Ajanta are limited so if you need to stay in the area, it's best to head to the Maharashtra Tourism Development Corporation's Ajanta T Junction Guest House (2,000 rupees per night) or Ajanta Tourist Resort in nearby Fardapur (1,700 rupees per night). If you prefer to stay in Aurangabad, Hotel Panchavati is a clean and comfortable budget option near the railway station and bus stand. While the Ajanta caves have some of India's most sophisticated ancient paintings, the Ellora caves are renowned for their extraordinary architecture. Both the caves have sculptures. Don't have time or money to visit both caves? Ellora receives about twice as many tourists as Ajanta, as it's more accessible. If your itinerary forces you to choose between the two sites, base you decision on whether you're more interested in the art at Ajanta, or architecture at Ellora. Also take into consideration the fact that Ajanta has an outstanding setting overlooking a gorge along the Waghora River, making it more enjoyable to explore. You can get an excellent view and perspective of inside the Kailasa Temple at Ellora by climbing up the hill around it. When visiting Ajanta, ask your driver to drop you at the viewpoint and meet you at the car park. Walk downhill from the viewpoint and enter at cave 8. From there, walk right to the end and start at cave 28. This will enable you to see nearly half the caves without the crowds. Bring a torch with you to the caves as many of them are quite dark and lighting is poor. Try to reach the caves before 10 a.m. to beat the crowds and tour buses. Security was increased at the Ellora caves in 2013, following incidents of tourists being sexually harassed by groups of young Indian guys. This has been effective in improving safety. However, tourists still need to be aware of harassment from hawkers and touts that charge inflated prices. Maintenance and cleanliness has improved at both the Ajanta and Ellora caves in recent years. The caves are now being looked after by a private company under the Indian government's "Adopt a Heritage Site" program. A three-day Ellora Ajanta International Festival is organized by Maharashtra Tourism each year. It features some of India's most distinguished musicians and and dancers. In 2016, the festival took place in October. However, dates for the next festival are uncertain and yet to be announced.